The Simpsons had been on the air for ten years by the time Futurama showed up. To help,the successful big sister started promoting Matt Groening's second animated series three months before its premiere. In the ninth episode of the tenth season, “Mayored to the Mob,” Üter wears a Futurama t-shirt to Springfield's Bi-Monthly Science Fiction Convention a.k.a. Bi-Mon-Sci-Fi-Con. "Set phasers on fun!" 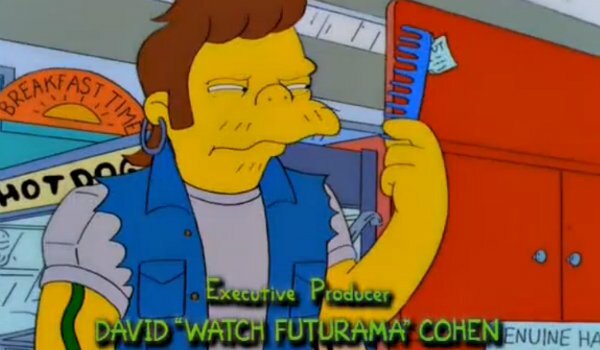 Even before Springfield Elementary's German exchange student showed his support for Futurama, David X. Cohen, co-creator of the sci-fi series and writer/supervising producer on The Simpsons, used his Halloween 'creepy credit' on “Treehouse of Horror IX” (Season 10, Episode 4) to promote his and Groening's new show. "Hell Toupée." What a title. This kind of shameless cross-promotion happened again once Futurama was resurrected by Comedy Central with “Beware My Cheating Bart” (Season 23, Episode 18) using Alienese to try and get viewers to "Watch Futurama Thursdays at 10." At the end of “Missionary: Impossible,” the fifteenth episode of the eleventh season, Fox is having a telethon to save the fledging network and several of the characters are seen manning the phones, including Bender, Mulder and Scully from The X Files, Hank Hill from King of the Hill, Thurgood Stubbs from The PJs and an especially agitated Rupert Murdoch. You know, the guy who owns the network. In “Bart vs. Lisa vs. the Third Grade” (Season 14, Episode 3), Homer buys the family satellite television with over 500 channels and it doesn't take long for this to effect Bart's performance at school. He wasn't exactly an exemplary student before the upgrade from basic cable, but the boy becomes so addicted to TV that he starts seeing small-screen characters in his class. 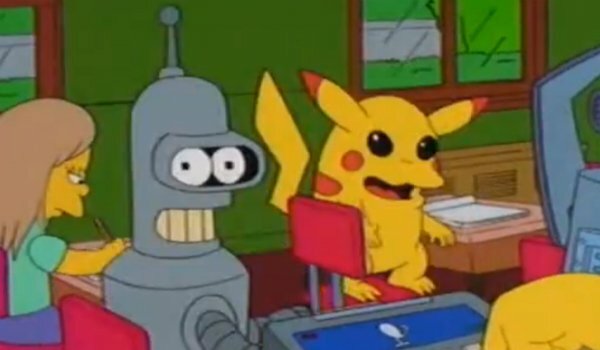 The hallucinations include Pokémon's Pikachu, the Friends in the fountain and, of course, Bender. The foul-mouthed robot is definitely the go-to Futurama easter egg. When The Simpsons take another trip to Springfield's Bi-Monthly Science Fiction Convention, in the seventeenth episode of the fifteenth season, “My Big Fat Geek Wedding,” Matt Groening is there signing autographs. 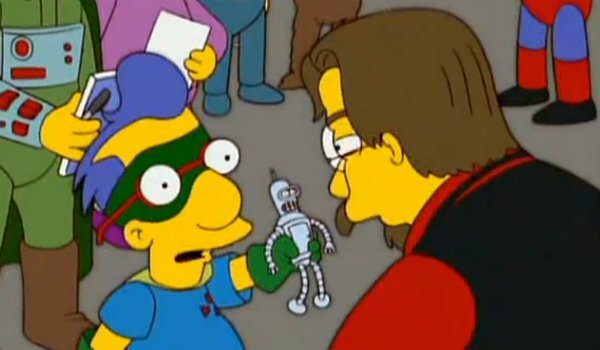 And, as if that easter egg wasn't enough, Milhouse then asks his creator to sign a Bender doll before we see him sketch Fry for a fan. It's a mega-meta moment. 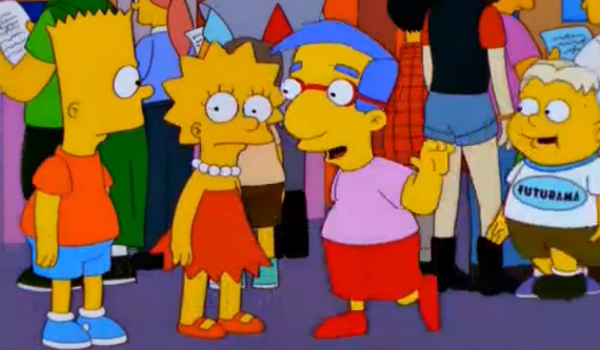 I also love how Lenny mispronounces Futurama and Milhouse mispronounces Groening all within the span of two seconds. 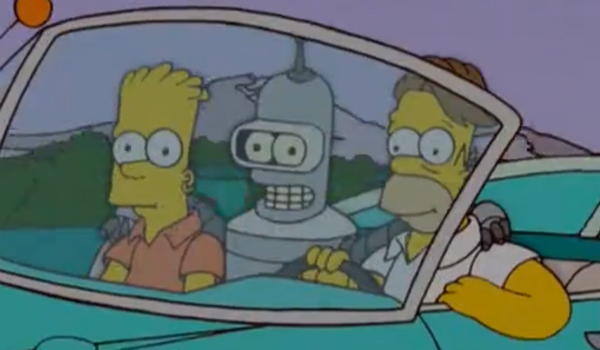 Another trend with The Simpsons'Futurama references is that they tend to appear very early in the episode, often in the opening titles or at least while the credits are still showing. 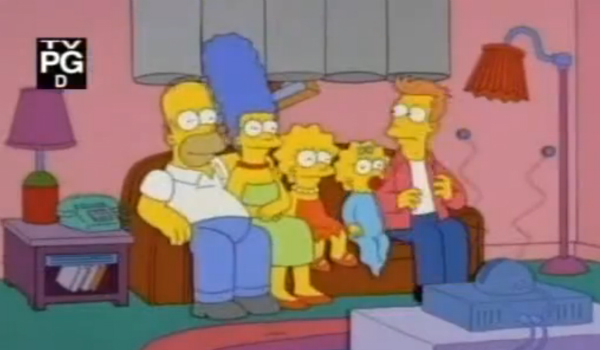 In “HOM?” (Season 12, Episode 9), the family arrives at the couch via tubes and Fry falls in Bart's place for a moment before being sucked back up and replaced. Futurama would also hijack the opening titles of “Love Is a Many Strangled Thing” (Season 22, Episode 17) with the theme song and Planet Express ship (briefly) crashing the opening titles. Oh, and if you missed the "Simpsorama" couch gag, it's worth a look. After termites force The Simpsons out of their house in “Helter Shelter” (Season 14, Episode 5), the family tours around Springfield looking for another place to stay. This leads them to Comic Book Guy's door and on his bookshelf sits a small Planet Express Ship. After all the not-so-subtle nods to Futurama so far (you know, like dropping Bender into a car with Homer and Bart), it's nice to finally get a reference that feels like a true easter egg. 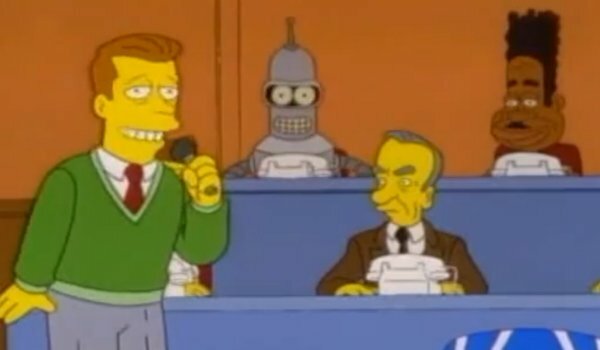 I already mentioned how Alienese advising viewers to watch Futurama showed up in “Beware My Cheating Bart,” the eighteenth installment of the twenty-third season, but the references didn't stop there. 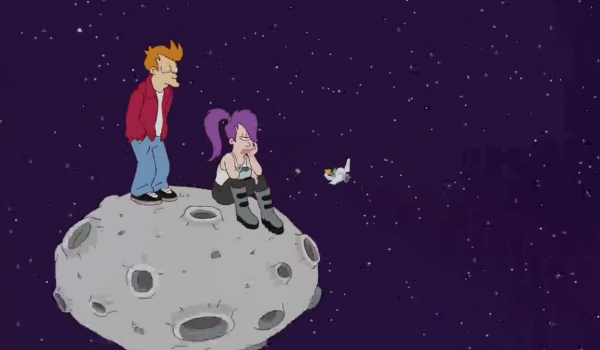 At the very end of The Simpsons episode, the show does an epic snap zoom-out shot that eventually shows Fry and Leela sitting on a small planet. It's a blink and you'll miss it moment. 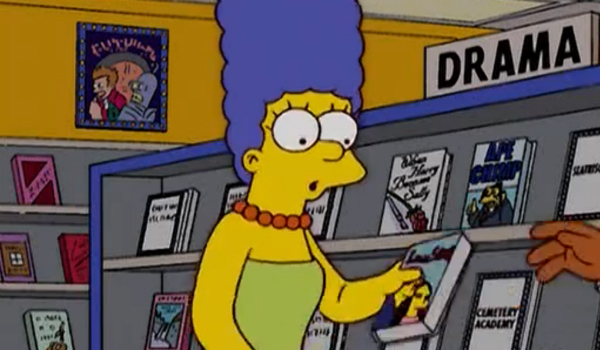 I told you, when The Simpsons travels into the future (even if it's only for a few seconds), there's probably going to be a Futruama easter egg or two. 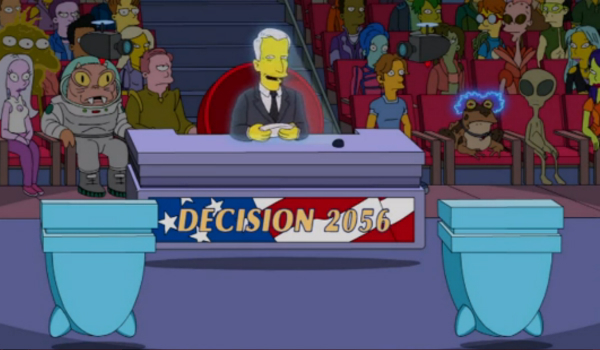 In the “The Kid is All Right” (Season 25, Episode 6), there's a flash-forward to a future election. In it, Hypnotoad as well as the Horrible Gelatinous Blob are sitting in the crowd for 'Decision 2056.' 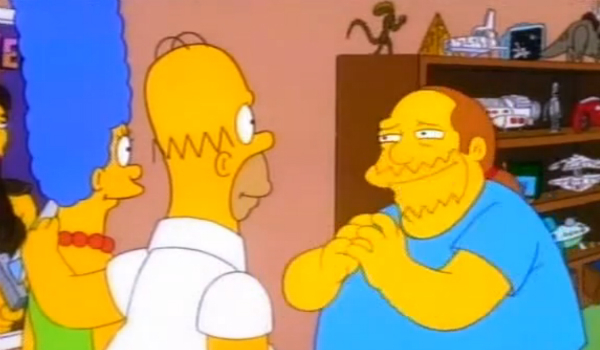 Hypnotoad also makes an appearance in the Guillermo del Toro couch gag for “Treehouse of Horror XXIV” (Season 25, Episode 2). Everybody Loves Hypnotoad. 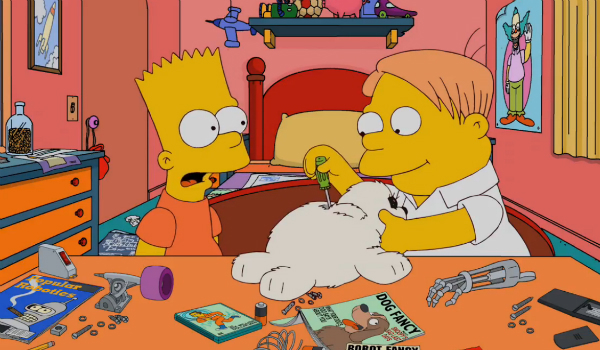 When Bart and Martin team up for the Springfield Elementary science fair, in “Replaceable You,” the fourth episode of the Season 23, they turn to a publication called 'Popular Robotics' for help. And who is on the cover? Bender, of course, smoking cigar and and all. The robotic baby seals that Bart and Martin build win the fair but eventually turn violent. That's what you get when you use a magazine with Bender on the cover for advice. 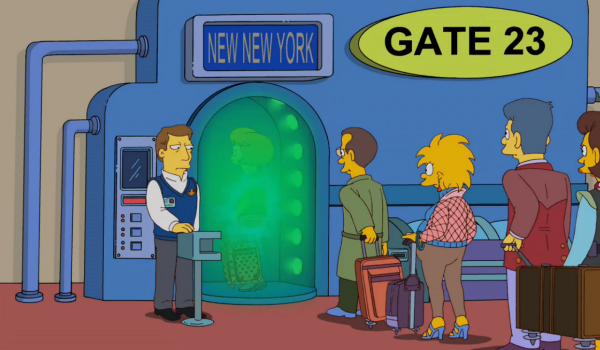 Since the ninth episode of the twenty-third season, “Holidays of Future Passed,” is set thirty years in The Simpsons future it obviously contains a Futurama easter egg. In another blink and you'll miss it moment, New New York flashes as a destination while Maggie waits in line at Heathrow Teleport. Not fair. I want to go to there. The Simpsons airs on Sundays at 8:00 p.m. ET on Fox.